Are you carrying any drugs? Are you carrying any alcohol? Our group of seven from Berkeley and Idaho Falls was joining at least 7,000 people from around the world to stand in solidarity with the people of the Standing Rock reservation, who do not want the Dakota Access Pipeline (DAPL) anywhere near their home and water supply. Deliberate about not draining resources from the camp, we stayed in Fort Yates, North Dakota, at St. Luke’s Episcopal Church and hauled in a trailer with food, propane, water, firewood and other gifts. Inside Oceti Sakowin, which is named for the Seven Fires Council of the Sioux nation, children were snow-sledding on a hill. We saw them just beyond a makeshift fence, covered in art, that surrounded the teepees, tents and trailers housing water protectors and their supporters. We adults soon got to work, forming a small train to take supplies to a donation tent. I handed a bundle of firewood to a Lakota man, who said, “Wašté, brother.” I recognized the word from Dances with Wolves, a 1990 movie my father (a Lutheran pastor) had taken me to see three times in the theater. Growing up in our household, bedtime stories were often about folks like Sitting Bull, Crazy Horse, Harriet Tubman and Sojourner Truth. My group then attended an orientation led by two Lakota women who informed us that we were at the largest gathering of indigenous people in memory. Indigenous people from all over the world had come, and the Sami of Norway had inspired a large Norwegian Bank to divest from the DAPL. Imagine if we could do the same: convince Wells Fargo and Bank of America and Chase to invest in infrastructure projects that showed love of one’s neighbor. Five of us came as chaplains from the Graduate Theological Union in Berkeley – Cal Lutheran’s Pacific Lutheran Theological Seminary is a member school – to pray with and support the water protectors. We came to say with our actions as people of faith that we loved them and supported their right to have protected drinking water and sacred burial grounds. We’d been preparing. In the fall at University Lutheran Chapel, our Gospel readings, psalms and liturgy were accompanied by readings from Ta-Nehisi Coates’ Between the World and Me, as the congregation engaged in learning about anti-racism as spiritual practice. A group of nine people from PLTS had joined a peaceful march asking the Army Corps of Engineers to deny the permit for Energy Transfer Partners to build the DAPL. If I’m not ashamed of the Gospel, I reflected then, I should take action to show that I as a future church leader love my neighbor – even when that is controversial, even if it means civil disobedience. Bringing good news to the poor, as Jesus said in Luke 4, means taking risks, getting uncomfortable and suffering. That’s what Jesus did, and that’s what Oscar Romero, Dietrich Bonheoffer and Dr. King did. I also wanted to follow the examples of ELCA Presiding Bishop Elizabeth Eaton and Bishop Kirby Unti, as well as Bishop Guy Erwin, who mentored me when I was a student at Cal Lutheran. I felt the encouragement that I know would have come from Professor Jarvis Streeter if he were alive. I went with the blessing of University Lutheran Chapel and its pastor, the Rev. Jeff Johnson, who also attended Cal Lutheran and PLTS. The day before leaving for Standing Rock, I listened to a Luther scholar’s sermon on Matthew 3: “It’s what you do with your life that matters. Bear fruit worthy of repentance.” It was time to go. Once I arrived, I found that I’d come with unhelpful expectations. Lori, one of the women who led our orientation, reminded us that Lakota had been at the encampment long before the influx of protesters and would be there after we left. We would get to leave – that simple fact was a reminder of privilege. I went to Oceti Sakowin with a notion of what organization and results should look like shaped by my own cultural perspective as a white male American. The expectation that organization and results will look a certain way is, well, colonial. People in my place often forget that, while our great-grandparents worked hard, they farmed land that had been taken from America’s first people. While our grandparents worked hard, they had access to jobs, education and homes that others did not simply because of the color of their skin. 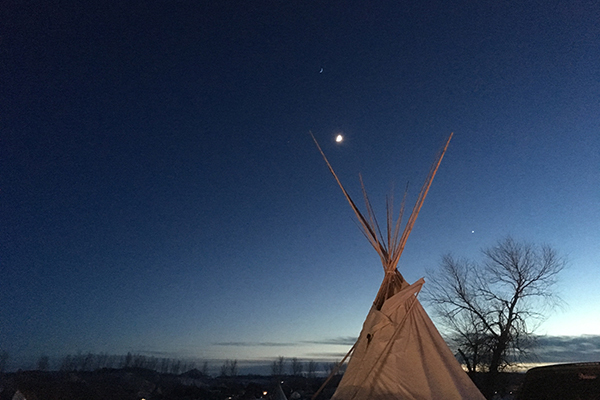 At the Sacred Fire center, clergy bundled in winter gear were among those listening to two men on horseback, descendants of Crazy Horse and Big Foot, who were adorned with feathers and dignity. A non-military helicopter had been circling the camp in spite of a no-fly order. Seven hundred different indigenous peoples are represented here. If you believe that life is sacred you are here. We see today that man has gone too far. This is an opportunity to be on the right side of history. The prophecy says water will be like gold when a white buffalo is born. The first white buffalo was born in Janesville, Wisconsin. All the fracking has to stop. Water is the first medicine. To respect and forgive are following medicines. We are asking for Obama to honor the treaties. čhékiya means to cry out and send your voice in prayer. Our prayers will only be answered if we humbly stand together. We’re going to see a lot of global disasters; a lot of sickness. All the fracking around Yellowstone is going to trigger it. We have to unite in prayer. A flock of geese in a V formation flew over the crowd. It was something out of a movie. Later that same day, Sunday, Dec. 4, the Army Corps of Engineers in a major announcement denied an easement allowing the pipeline to cross Lake Oahe, which brought work to a halt. People were cheering. When we departed on the following day, however, 18 massive poles were still standing to light the pipeline construction. Energy Transfer Partners didn’t face the same swift legal accountability that the Morton County Sheriff was exacting upon the nonviolent water protectors, who had been pounded with water cannons in sub-zero temperatures. One person’s arm nearly had to be amputated. Is this justice? To make progress in my vocation of empowering our oppressed siblings, it’s crucial to be mindful of white privilege, and crucial to know that empowerment is something you do with someone, not for someone. When we as church leaders read Matthew 25:34-45, and as a Christian-affiliated school, we are challenged to identify who “the least of these” are in our world today: “Whatever you do to the least of these you do to me.” This would be easy if Jesus just showed up robed and bearded as we might imagine. But he appears instead in the form of the least of these: Lakota children who play in the river and drink the water threatened by the DAPL. Jesus appears in the people of Flint, Michigan, whose water has been contaminated by industrial pollution. Jesus appears in the children of Phnom Penh, Cambodia, who sort garbage and beg and are counted lucky if they go to school. Jesus appears in the dozens of unarmed black men shot by police in the USA. Jesus appears in the victims of domestic violence who may bring children back to a violent man because the state or federal government defunded transitional housing for survivors. Jesus appears in the children of illegal immigrants, and Jesus appears in the mentally ill and homeless who rely on mercy and who sleep in doorways and on sidewalks. When we ignore them we ignore Jesus. “Loving your neighbor means having your neighbor’s back,” said the Rev. Johnson. What is obvious to some will always be denied and disputed by others. It was obvious to me that remaining silent when the DAPL was threatening the Lakota people’s water was not loving my neighbor, and that such silence would continue 500 years of oppression against indigenous people on this continent. We as a church must bear fruit worthy of repentance. We must love our neighbors by having their backs. How many of us will call Wells Fargo, Chase, Bank of America, Citibank and go through the inconvenience of taking our money instead to a credit union or a bank that is not funding Energy Transfer Partners’ construction of this pipeline? Paul Benz ’08 is a first-year M.Div. student at Pacific Lutheran Theological Seminary and an Evangelical Lutheran Church of America Fund for Leaders Scholar. He served in the U.S. Peace Corps in Uganda from 2013-16 after co-star roles on Criminal Minds, House and with Cal Lutheran’s own Kingsmen Shakespeare Company.